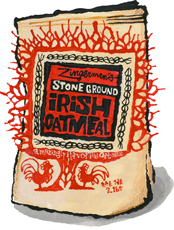 Stone Ground Irish Oatmeal for sale. Buy online at Zingerman's Mail Order. Gourmet Gifts. Food Gifts. Eating this for the first time is like taking your first promenade in Paris, France, when all you’ve known is Paris, Texas: you realize just how good oatmeal can be. The Walton family has been milling oats in Ireland since the 1700s, and they still use old stone wheels, which I think leave the oats better tasting than steel-cut. The result is a coarse meal that has its natural oils still intact (making the meal darker than other oatmeal). Facts aside, the most important thing is the way it tastes, which is darn, darn good. "Stone ground and very coarse, it's different from anyone else's in Ireland, full of flavor when simply cooked and immensely satisfying in its grainy texture." "At Walton’s Mill, which has been in operation since 1832, the emphasis is on flavor, not convenience. It is one of only seven Irish products to earn the Slow Food Ark of Taste, a catalogue of exceptional international heritage foods... The stone milling leaves the natural oils intact, so the flavor is nuttier and richer than commercial varieties." "May well be the best oatmeal I've ever eaten." I toasted a half cup in a bit of butter in a hot skillet until it was nicely tan, then stirred in a cup of milk and a cup of water, plus half a teaspoon of sea salt. I cooked it for thirty minutes and let it sit in the double boiler for another twenty to thicken up. Since it was toasted in butter, I merely added a little half & half. Keep your oatmeal in the freezer. Even though it won't go bad for some time if kept at room temperature, it lasts much longer in the freezer. Gluten free, though it's ground in a mill that also processes wheat and rye, so use sound judgement. Download the Irish Biscuit Recipe by Myrtle Allen from Ballymaloe, Ireland.